Raoul Albin Louis Salan (French pronunciation: ​[ʁaul salɑ̃]; 10 June 1899 – 3 July 1984) was a French Army general. He served as the fourth French commanding general during the First Indochina War. He was one of four generals who organized the 1961 Algiers Putsch operation. He was the founder of the Organisation armée secrète. He was the most decorated soldier in the French Army. Salan was born on 10 June 1899 in Roquecourbe, Tarn. He graduated from the École spéciale militaire de Saint-Cyr. He served in the French Army during World War I.
Salan served as the commander of French forces in Vietnam from 1945 to 1947. 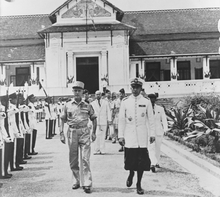 By 1948, he was commander of all French land forces in East Asia; after the death of Jean de Lattre de Tassigny in 1952, Salan became the commander-in-chief in Indochina. Salan served as commander-in-chief of French forces in French Algeria in 1956. In 1958, Salan called for the return to power of Charles De Gaulle, believing that the latter would protect French Algeria. He retired shortly after, first moving to Spain, then to mainland France. He was banned from entering Algeria in 1960. Nevertheless, Salan returned to Algeria to organize the putsch on 21 April 1961 with André Zeller, Edmond Jouhaud and Maurice Challe. After the failure of the putsch, he became the chief of Organisation armée secrète (OAS), which attempted to disrupt the April 1962 Peace Evian Accords. He was arrested in April 1962. Salan was charged with treason and condemned in absentia to death. Then, in April 1962, he was arrested in Algiers. The death sentence on him was commuted to life imprisonment. He was pardoned in 1968. Salan was the most decorated soldier in the French Army. Salan died on 3 July 1984. Every year, former members of the OAS bring flowers to his tomb on his death anniversary. ^ a b c d Krebs, Albin (July 4, 1984). "RAOUL SALAN DIES; LED ALGERIA PLOT". The New York Times. Retrieved June 5, 2016. ^ a b c d e f g h i j "Gen. Raoul Salan. France's most decorated soldier dies". Santa Cruz Sentinel. Santa Cruz, California. July 4, 1984. p. 10. Retrieved June 5, 2016 – via Newspapers.com. (Registration required (help)). ^ Cros, Philippe (June 11, 2014). "Les « fidèles » du chef de l'OAS commémorent". La Montagne. Retrieved June 5, 2016. General Paul Aussaresses, The Battle of the Casbah: Terrorism and Counter-Terrorism in Algeria, 1955-1957. (New York: Enigma Books, 2010) ISBN 978-1-929631-30-8. Wikimedia Commons has media related to Raoul Salan.